Notaries wrote down 282 laws in the Code of Hammurabi, King of Babylon in 1754 BC. It is the oldest evidence of recorded law. Babylon was a city in Mesopotamia, near the Tigris and Euphrates Rivers. Hammurabi worked to fight corruption in public officials and had no mercy for those convicted of fraud or bribery. The code was inscribed on a stele and displayed in a public place for all to read. It is now in the Louvre Museum in Paris. The text of the code may be found online at Yale Law School at The Code of Hammurabi. The Code of Hammurabi guaranteed many rights to citizens and left parties free to contract, as a rule. The contract was drawn up in the temple by a notary public, and confirmed by an oath “by god and the king“. It was publicly sealed and witnessed. The codified laws contain no direct oaths, but many indications that the taking of an oath was a common custom. No specific god was recommended as the deity by whom to swear an oath. But, it was directed that one take an oath in the name of god, or in the presence of god. During that time, legal documents and contracts contained oaths. The documents were inscribed using cuneiform on sun-dried or baked clay tablets. The oaths were made to the local gods and kings. The oath form was usually “by the god [name] they swore”. This was followed by witnesses, both male, and female, and occasionally a scribe, also male and female. It was often stated that the contract was sealed. Seals of witnesses were used. Some used a thumbnail mark rather than a seal. Temple officials were sometimes used as witnesses. A notary public was a common witness to contracts. Different cities worshiped different gods. The god of the place where the contract was made was always invoked, sometimes with associated deities. Promises were made not to repudiate the contract, and not to change the contents, Some documents contained a curse, such as “may he be an enemy of [god or king name] who repudiates the transaction”, or “curse of [god name] upon him who changes the contents of this tablet”, or “the fear of [king name] be upon him”. Common contract phrases included “for its full price he has weighed out the money”, and “with the bukanu, he has been passed over”, and “for ever hereafter, man against man shall not make claim”. The bukanu was used in a ceremony that “originally pertained to the sale of slaves and meant that the stamp or mark of ownership was changed. The bukanu was believed to be a dye or stamp with a short handle. 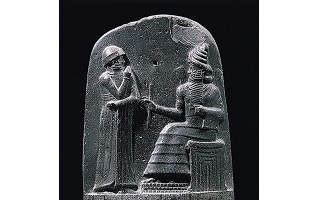 During the time of Hammurabi, the use of the bukanu was common to all kinds of sales. Contracts usually were made in the temple of a local god, which served as a court house and archive of records. A specific place in the temple was often mentioned. Sometimes it was before a golden emblem of a god, or at the gate. Judges administered an oath by the god of the temple. Judges and scribes served as witnesses. Elders assisted the judge. Some contestants were directed to go to the temple for purification, before taking an oath. Lease and rent contracts never had a direct oath. But, the agreement was always made in the presence of one or more deities. The fact that many of these contracts were drawn up in a temple and before gods may have been a substitute for expressing a direct oath. The laws of the Code of Hammurabi were used in new lands conquered by the king. Hammurabi was a wise, righteous, god-fearing ruler and leader. The epilog to the code includes a curse that no one may disobey or alter the laws, without suffering penalty, loss, hardship and the wrath of god. Also, see our article on the history of the oath.